The unbroken chain of offering melodic tributes to Swami Vivekananda on his birthday has been deferentially continued by Ramakrishna Mission Institute of Culture for the last three decades. This year, the Institute organised a day-long Swami Vivekananda Music Festival at Vivekananda Hall with the same veneration and with almost the same features; but with some perceptible changes as well. Pandit Jasraj, the star of the morning session (9 am-12.30 pm), made his first appearance on this venerated platform with raga charukeshi, a Carnatic raga, which gives a long rope by way of offering a license to sing it at any time of the day. Visibly vexed with the sound system, the veteran vocalist was inspired later by the awesome tabla support provided by Pandit Swapan Chaudhuri and respectful shadow-playing by the harmonium of Mukund Petkar. Pandit Jasraj then moved on to several devotional items including Har Har Bhootnath, a composition of Swami Vivekananda (raga darbari) and his own signature item Mata Kalika (raga adana). It was quite unexpected that the Master would choose these ragas while none of them belong to this time zone. Also the unwritten code of conduct is that raga bhairavi should be sung as the last item of a soiree. The bhairavi-based Guruvandana in the inaugural session of the day was surprising too. Earlier, inaugurated by Swami Supurnanada, the day began with Pratik Chaudhuri (raga lalit with Sukhvinder Singh’s tabla) who was too eager to display his skill on the sitar and as a result failed to evoke the spirit of this beautiful morning melody. The vibrant character of the afternoon session was essentially scripted by a group of young, brilliant Odissi exponents, led by Shib Narayan Banerjee. Groomed by Gurus Giridhari Nayak and Ratikanta-Sujata Mohapatra at Srijan in Bhubhaneswar, Banerjee is a competent teacher as well. Despite the recorded music, their portrayal of Bageshri pallavi, Ardha-narishwara and Sita-Haran (raga malika, tala malika/ektali with music by Raghunath Panigrahi and choreography by Guru Kelucharan Mohapatra) stood out for well-synced body movements, footwork, facial expressions and superb use of ekahaaryas for swapping roles of Sita, Ravana and Jatayu. However, some of their, otherwise lovely, costumes looked incomplete without the hip-guards. Next, the Venu-Veena duet by RK Padmanabha (Saraswati veena) and Chandan Kumar (flute) was as lively. They warmed up with Valachi Vachhi (Navaraga malika or nine raga-based Varnam in Adi talam on a composition by Patnam Subramania Iyer), Vinayaka Ninnu (hamsadwani, adi, Ramakrishna Bhagavatar), Sadinchine (Arabhi, Pancharatna kriti by Tyagaraja) and Banturitikolu (hamsanadham, adi desadi, Tyagaraja) before presenting their piece-de-resistance Nagumomu (Abheri Bhimpalasi in HCM parlance, adi, Tyagaraja). During this, both virtuosos shared ragam and tanam by turn, Veena incorporated a lot of guitar elements including double-string induced harmony, staccato notes, et al. At times it went off key in the higher reaches. 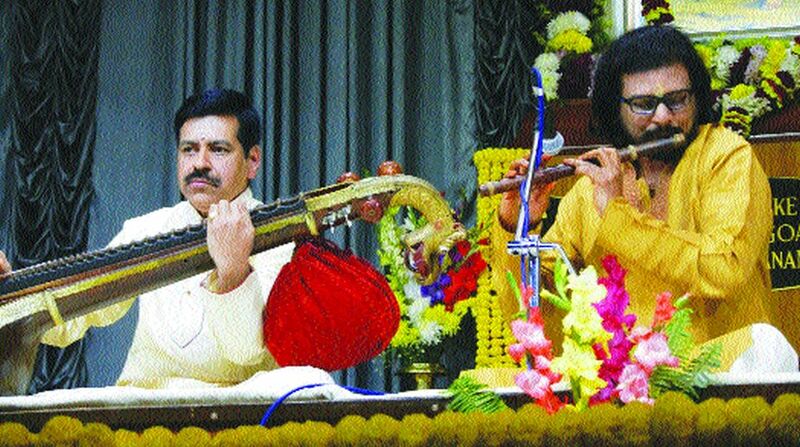 In comparison, the flute remained tradition bound and during Pallavi exposition, exhibited good chemistry with the mridangam of Jayachandra Rao, who later gifted an awe-inspiring tani replete with varieties of mnemonics on both sides of the instrument. The ghatam of PV Sairam followed suit but stopped abruptly before an enjoyable sawal-jawab with the mridangam. With Venkatachalanilayam (sindhu bhairavi, purandaradasa), this session came to an end. Although the star of the third and last session was Pandit Hariprasad Chaurasia, who makes it a point to offer his melodic obeisance every year for the last couple of decades, it was young sarangi exponent Harsh Narayan, who gave a pleasant surprise with his recital in raga puria dhanasri and a mishra pilu dhun with young tabla wizard Anubrata Chatterjee as his companion. Harsh, the grandson-disciple of the legendary sarangi maestro Ramnarayan, began brilliantly and could do better by containing within the time-limit by cutting down on too much of sapat taans; apparently, his comfort zone. Hari-ji, beautifully supported by his disciple Rajesh-ji on the flute and Subhankar Banerjee on the tabla, delineated raga bihag in his usual manner, which allows the raga to come out in the open only after a prolonged game of hide and seek. Later he resorted to terrific rhythm-play during the nine-beat matta tala-based gatkari. The inspired introductions by Biplab Ganguly, the compere of the event for the last 25 years in an unbroken chain, added an extra verve as usual. For a change the “non-Hindustani” items were introduced by Baburaj Maharaj, a musician and the guiding spirit behind the entire event. One noticed that the sober, dual colour invitation cards, almost a signature of the Institute’s erstwhile events, have undergone a sea-change with a riot of colours as their mainstay. Also, the strict time-management has slackened to a great extent. With a unique concept of featuring only instrumental music belonging to the Maihar Gharana, Sohini Music Organisation presented Tantra Samaroha, 2017 at Beliaghata Sukanta Mancha. The evening reached a climax with a Hansaveena recital by Barun Kumar Pal, a senior disciple of Pandit Ravi Shankar. He presented raga jog. After a captivating alap and jod he played a madhyalaya gatkari set to sitarkhani and a drut gatkari in teental. Subhajyoti Guha provided fantastic support on the tabla. Beginning with a sitar ensemble by the students of Subhajit Majumdar of the Maihar Gharana, a sarod recital by Indrayuddh Majumder, the son-disciple of Pandit Tejendra Narayan Majumder of the Maihar Gharana, came up next. He played raga hemant replete with alap, jod and teental gatkaris ably supported by Rupak Bhattacharya on the tabla. This melodious presentation was followed by a sitar recital by young Kalyan Majumdar, son-disciple of Subhajit Majumdar and Soumitra Lahiri of Vishnupur Gharana. He chose to play elaborate alap and gatkaris in medium-paced rupak and fast teental in beautiful raga rageshri. Kalyan ended his recital with a majh khamaj composition set to deepchandi. The audience responded to his performance with overwhelming applause. Soumen Nandy gave him able support on the tabla. The event also witnessed felicitations to the legendary sarod maestro, Buddhadev Das Gupta; eminent vocalist-musicologist, Vijay Kichlu and Barun Kumar Pal. Nibedan (Serampore) organised its annual fundraising cultural event recently at Serampore Rabindra Bhawan that saw Pandit Venkatesh Kumar, Bengal’s blue-eyed vocalist at present, mesmerising his audience with soulful, melodious rendition of raga shankara followed by raga durga. He concluded with an emotive bhajan in bhairavi. Whenever in Bengal, he chooses Pandit Samar Saha as his tabla accompanist. This event was no exception and together they scripted a scintillating performance. Earlier the evening began with the oceanic raga yaman on the violin; evocatively played by Sangeeta Shankar. Sensitively supported by Hindole Majumdar on the tabla, she followed it up with a khamaj-based dadra-dhun. This programme is apparently like oxygen to Nibedan’s insignificant monetary fund, which is much required to finance the different social works they do. With the limited resources like monthly subscription from members and small donations from local people, they organise health awareness camps, free eye check-up camps, subsequent IOL surgery, free child care camp and blood donation camps. The day-long event at Ahindra Mancha marked the 46th Annual Music Conference organised by Manindra Sangeet Tirtha, an Andul-based institution founded by the late Pataki Bhattacharya and now nurtured by well-known vocalist Koushik Bhattacharya. The inaugural ceremony turned into a rendezvous of artistes belonging to all art forms; eminent among them were Srikumar Chatterjee (vocalist), Kastury Chatterjee (actor TV and theatre), Shreela Mazumder (actress), Sameer Chatterjee (tabla player), Shashanka Bakshi (tabla player), Ujjal Debnath (creative artist) and several others. Essentially organised to showcase the talented students’ solo and group recitals in khayal and thumri, the day came to a close when celebrated singer Haimanti Shukla adorned the stage to render khayal. Ably supported by the seasoned tabla of Sujit Saha and harmonium of Hiranmay Mitra, she sang raga puria kalyan — vilambit and drut, followed it up with shyam kalyan and a kafi. Encores led her to sing ragashrayi Bangla-Gaan, her forte. It was followed by Koushik Bhattacharya’s brilliant tradition-bound portrayal of raga bihag, replete with slow ektal and fast teental khayals. Tabla maestro Subhankar Banerjee’s excellent support enhanced the beauty of this presentation manifold; so did Sanatan Goswami’s unobtrusive harmonium. Bhattacharya also sang a devotional composition in raga charukesi and concluded with Ras ke bhare tore naina in bhairavi. Anchor Sritoma Mukhopadhyay threaded the items of the entire day very artistically.